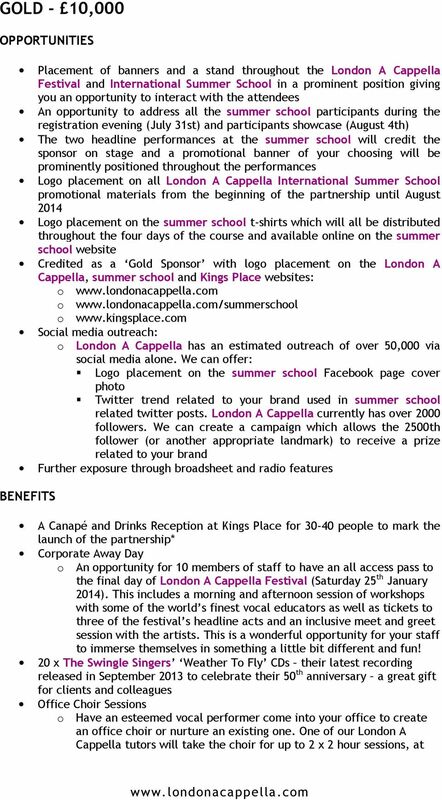 1 SPONSORSHIP PROPOSAL SPONSORSHIP PROGRAMME The London A Cappella International Summer School offers opportunities for sponsors to communicate to target audiences through tailored packages of benefits. 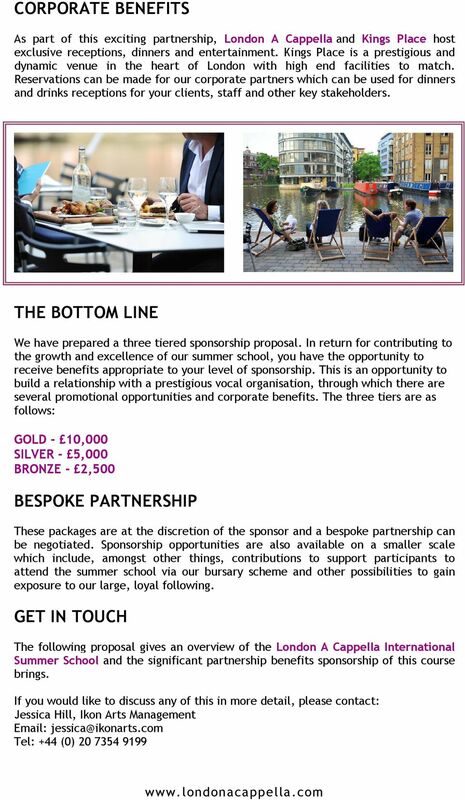 These packages are at the discretion of the sponsor and a bespoke partnership can be negotiated. ABOUT LONDON A CAPPELLA Dedicated to the many forms of a cappella, London A Cappella is a unique hub of vocal activity. Presenting two world-class flagship projects, London A Cappella prides itself in drawing in the finest international a cappella performers to the capital. 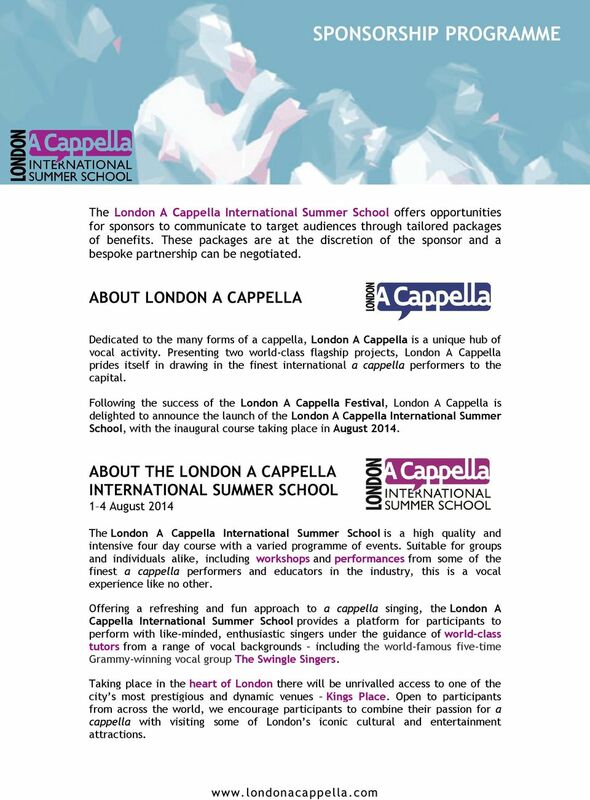 Following the success of the London A Cappella Festival, London A Cappella is delighted to announce the launch of the London A Cappella International Summer School, with the inaugural course taking place in August ABOUT THE LONDON A CAPPELLA INTERNATIONAL SUMMER SCHOOL 1 4 August 2014 The London A Cappella International Summer School is a high quality and intensive four day course with a varied programme of events. Suitable for groups and individuals alike, including workshops and performances from some of the finest a cappella performers and educators in the industry, this is a vocal experience like no other. 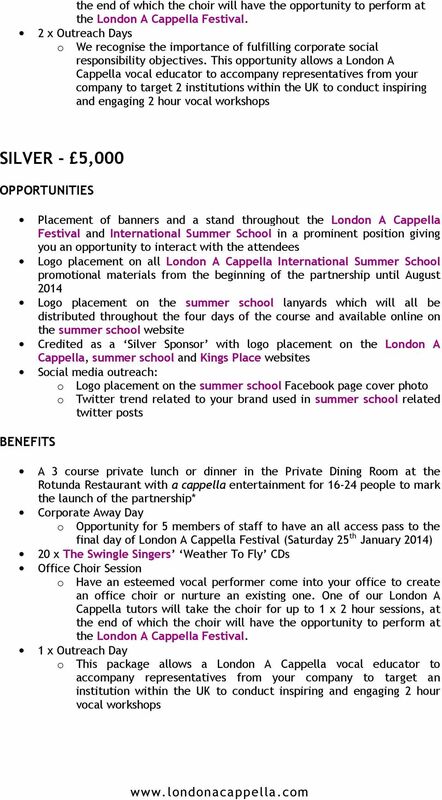 Offering a refreshing and fun approach to a cappella singing, the London A Cappella International Summer School provides a platform for participants to perform with like-minded, enthusiastic singers under the guidance of world-class tutors from a range of vocal backgrounds including the world-famous five-time Grammy-winning vocal group The Swingle Singers. Taking place in the heart of London there will be unrivalled access to one of the city s most prestigious and dynamic venues Kings Place. Open to participants from across the world, we encourage participants to combine their passion for a cappella with visiting some of London s iconic cultural and entertainment attractions. 2 ABOUT THE ORGANISERS With over 20 years experience in music management Ikon Arts Management develops world-wide concerts and tours, special projects and events for some of the worlds leading a cappella vocal groups and diverse contemporary ensembles. Kings Place is a hub for music, art, dialogue and food, housed in an award-winning building in Kings Cross, which also provides world class conferencing, events and office space. The Swingle Singers are an international a cappella phenomenon. The Swingle Singers have performed all across the UK, America, Asia, and virtually every country in Europe, have released over 50 recordings, and have won five Grammy Awards. 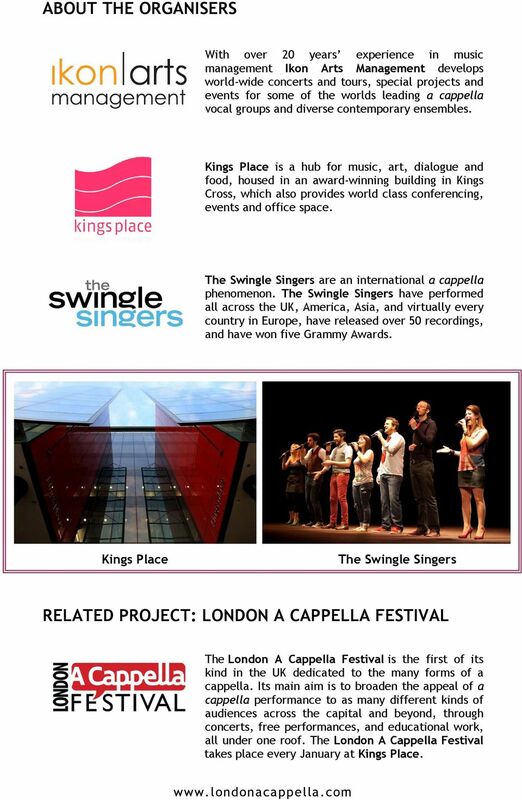 Kings Place The Swingle Singers RELATED PROJECT: LONDON A CAPPELLA FESTIVAL The London A Cappella Festival is the first of its kind in the UK dedicated to the many forms of a cappella. Its main aim is to broaden the appeal of a cappella performance to as many different kinds of audiences across the capital and beyond, through concerts, free performances, and educational work, all under one roof. The London A Cappella Festival takes place every January at Kings Place. 3 CONNECTING WITH DIVERSE AUDIENCES London A Cappella offers extensive promotional possibilities and face to face interaction with the vast international vocal community and loyal a cappella following. The summer school can be tailored for people of all ages with a wide range of interests. As such, we have allowed our programme to be both full and diverse. Through additional workshops, masterclasses and concerts we can provide further scope to embed our partnership, opening up a number of platforms for you to talk to schools, families, community projects and international audiences. 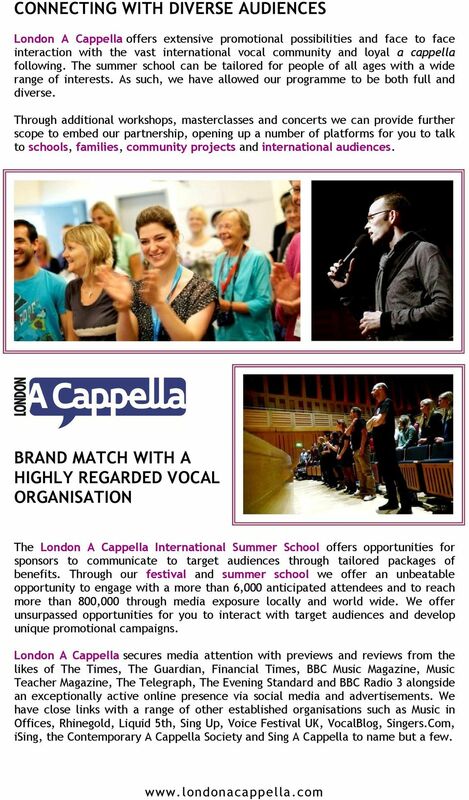 BRAND MATCH WITH A HIGHLY REGARDED VOCAL ORGANISATION The London A Cappella International Summer School offers opportunities for sponsors to communicate to target audiences through tailored packages of benefits. Through our festival and summer school we offer an unbeatable opportunity to engage with a more than 6,000 anticipated attendees and to reach more than 800,000 through media exposure locally and world wide. We offer unsurpassed opportunities for you to interact with target audiences and develop unique promotional campaigns. London A Cappella secures media attention with previews and reviews from the likes of The Times, The Guardian, Financial Times, BBC Music Magazine, Music Teacher Magazine, The Telegraph, The Evening Standard and BBC Radio 3 alongside an exceptionally active online presence via social media and advertisements. 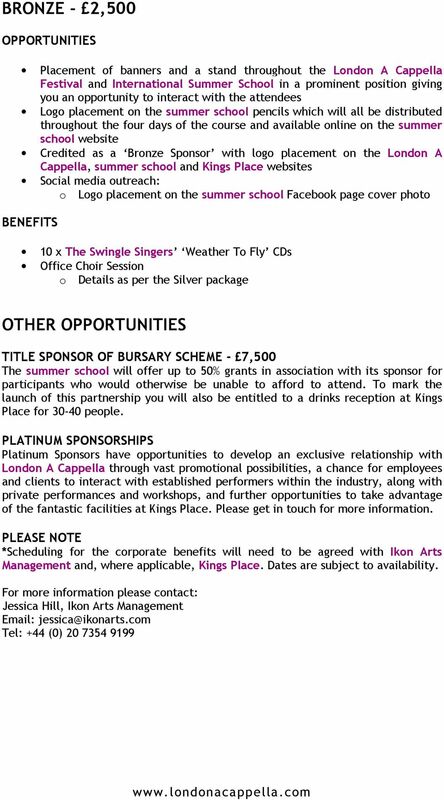 We have close links with a range of other established organisations such as Music in Offices, Rhinegold, Liquid 5th, Sing Up, Voice Festival UK, VocalBlog, Singers.Com, ising, the Contemporary A Cappella Society and Sing A Cappella to name but a few. Meeting Professionals International Greater Calgary Chapter ship Sales Package About MPI Meeting Professionals International (MPI) is the largest and most vibrant global meeting and event industry association. What is Big Data Week all about?